I must say, Weezy is going through one of the most illegitimate jail sentences ever. Weezy told fans in February that he would be granted an iPod. “I’ll have an iPod, and I’ll make sure they keep sending me beats,” he said. Now it’s been announced that Weezy has been allowed to stay updated with sports and has been granted permission to write a sports blog. The website, weezythanxyou.com, has Weezy’s commentary on the world of sports and allows you to buy Free Weezy shirts. This entry was posted in News and tagged lil wayne, wee, weezy, weezy thanx you. Bookmark the permalink. 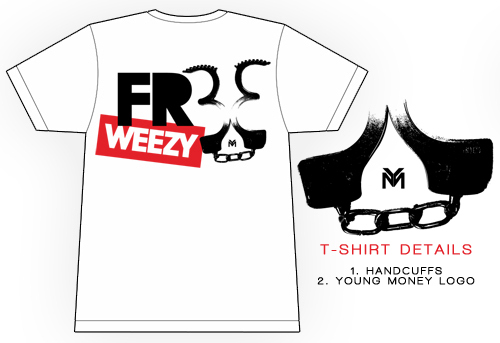 i’m giving five stars to the free weezy t-shirts.